Providing you the best range of stock pot cooking range, three burner cooking range, platform bulk cooking range, dough kneader, gas range and chapati puffer with effective & timely delivery. We are dedicatedly engaged in manufacturing, supplying and distributing Stock Pot Cooking Range. It is the perfect solution for heating up large stock pots and Asian woks. 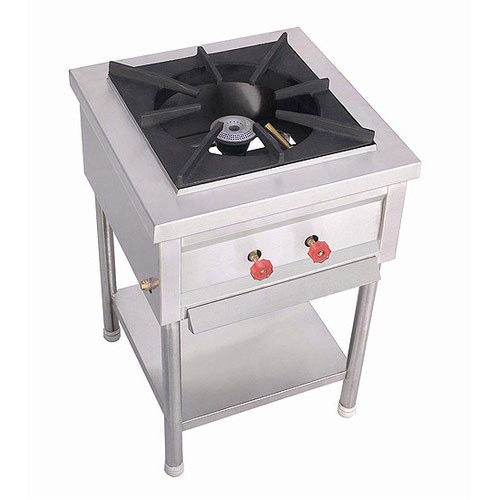 Equipped with a large burner specifically for stock pots, these models take up less space than traditional ranges. These can be used to prepare stir fry, pasta, soup, sauce and many more items. 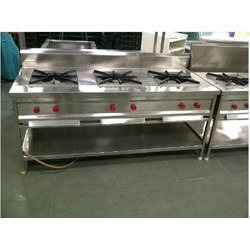 We are delighted to cater our clients with the premium quality assortment of Three Burner Cooking Range range that are widely used in hotels and restaurants for reducing their serving time. 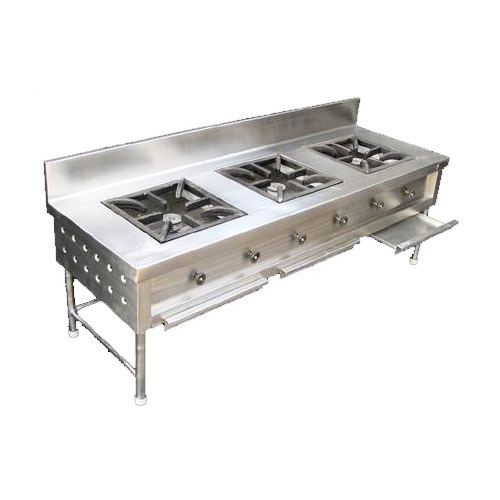 We are providing our clients with Platform Bulk Cooking Range that is available in four burner or two burner types. Available with hot plate & oven below, our products are widely used in five star hotels and restaurant. Our products are manufactured using high grade raw material and latest technology to ensure that these meet international quality norms. Our company is concerned with the manufacture and supply of Dough Kneader. These come in compact design and take less time for preparing the dough. Vastly used at homes, hotels and restaurants, these easy to use & clean kneaders are suitable for making dough for preparing chapatis, bread, puris and other food items. 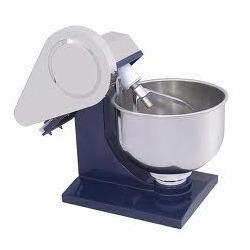 Proffered dough kneaders fold and stretch the dough for aeration & fermentation purposes. With hard-earned experience of our adept professionals, we offer Gas Range. 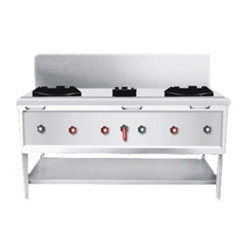 This gas range is designed utilizing finest quality raw material as per with the quality standard. 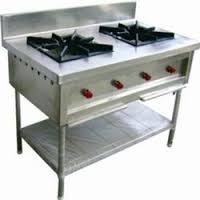 Offered gas range is accessible in number of specifications according to the requirements of customers. The given gas range is completely checked before the delivery for make certain the quality at our end. With a focus on the ever-evolving demands of our customers, we manufacture and supply a wide range of uniquely designed Chapati Puffer. Used to prepare puffed chapatis. 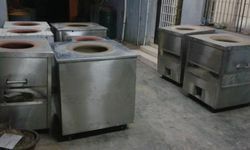 Our organization holds expertise in production of Tandoor Oven to our clients. Developed at our state of art manufacturing unit by using quality components. We are manufacturing Chinese Cooking Range. M-Type HP Burners equipped with needle control valves. Top and back splash of the range fabricated in heavy duty gauge of stainless steel. Gutter: 100mm throughout the length and provided with drain waste. Water Pipe for easy cleaning of the top surface is provided. Swivel cold water goose neck faucet provided in the range. 03 no. of heavy duty removable Pan Support (with Exhaust Vent Cut Outs) for easy cleaning. Height adjustable stainless steel bullet feet. 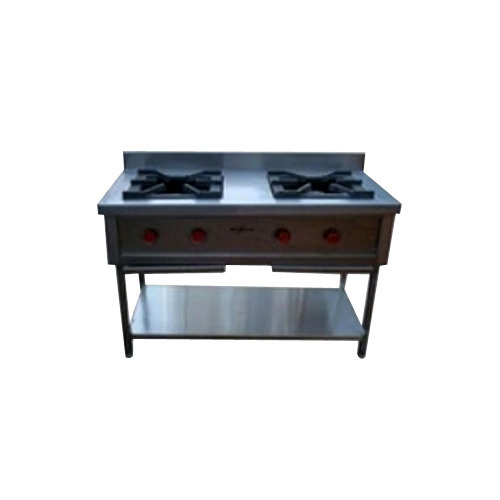 Chinese cooking Range can be fabricated in any custom size to suit as per kitchen's requirement. 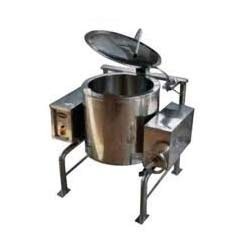 With the prime objective of catering to the different needs of the customers, we are engaged in offering Tilting Bulk Cooker. 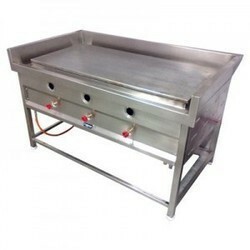 It is specially designed by well known professionals to carry out bulk cooking easily. As a result, our offered Tilting Bulk Cooker is extensively known for its remarkable quality, noted finish, minimal maintenance requirements, and many more. Looking for “Kitchen Cooking Range”?